O God, who willed that your Only Begotten Son should undergo the Cross to save the human race, grant, we pray, that we, who have known his mystery on earth, may merit the grace of his redemption in heaven. Through our Lord Jesus Christ, your Son, who lives and reigns with you in the unity of the Holy Spirit, one God, for ever and ever. The lessons from the Breviary tell us that Emperor Heraclius carried the Cross back to Jerusalem on his shoulders. He was clothed with costly garments and with ornaments of precious stones. But at the entrance to Mt. Calvary a strange incident occurred. Try as hard as he would, he could not go forward. Zacharias, the Bishop of Jerusalem, then said to the astonished monarch: "Consider, O Emperor, that with these triumphal ornaments you are far from resembling Jesus carrying His Cross." The Emperor then put on a penitential garb and continued the journey. Historically today is also the feast of St. Notburga, a peasant who lived in the Tyrol, Austria and St. Maternus, Bishop of Cologne. Symbol: The cross of triumph is usually pictured as a globe with the cross on top, symbolic of the triumph of our Savior over the sin of the world, and world conquest of His Gospel through the means of a grace (cross and orb). The Wednesday, Friday and Saturday following September 14 marks one of the Ember Days of the Church. See Ember Days for more information. Study different symbols and types of crosses, history and/or significance. Then have an art project — creating own crosses, using different media, including paper. See variations of crosses for some ideas. Study the history of St. Helena and Constantine, especially St. Helena’s quest for finding the relics of Jesus. Make sure that crucifixes are displayed prominently throughout your home. Point out the crucifix in every room even to the smallest ones. Your child's first word may be "Jesus"! Explain the meaning of the Sign of the Cross to your children and be sure that even the little ones are taught how to make it. Encourage your children to make reparation for sin; read about sacramentals. Teach your children a short ejaculatory prayer such as "Through the sign of the Cross deliver us from our enemies, O our God!". Make a dessert in the form of a cross, or decorated with a cross. Although usually made on Good Friday, Hot Cross Buns would be appropriate for this day. Make a cross cake, either using a cross form cake pan, or bake a sheet cake (recipe of choice). Once cool, cut the cake in half, length ways. Then cut one of these sections in half width ways. This makes three sections - one long and two short. Lay the long section onto a serving plate. Set the two small sections next to the long section forming a cross. Frost and decorate as desired. Tradition holds that sweet basil grew over the hill where St. Helena found the Holy Cross, so in Greece the faithful are given sprigs of basil by the priest. Cook a basil pesto, tomato basil salad (with the last of the summer tomatoes) or some other type of recipe that includes basil, and explain to the family. More Ideas: Women for Faith and Family and Catholic Encyclopedia. Folklore has that the weather on the Ember Days of this month (September 15, 17, and 18) will foretell the weather for three successive months. So Wednesday, September 15, will forecast the weather for October; Friday, September 17, for November; and Saturday, September 18, for December. St. Zita of Lucca, Italy, is the best-known patron of domestic servants. A less-known contemporary of Zita's was St. Notburga of Austria, who is venerated in the Austrian Tyrol, Bavaria, Istria, Croatia and Slovenia. Many a church in these lands bears her name. Notburga was born at Rattenberg-on-the-Inn, a town in the Austrian Tyrol not far to the east of Innsbruck. At the age of 18, this devout young woman of peasant stock entered the employment of Count Henry of Rattenberg as a member of his kitchen staff. Notburga was always very solicitous of the poor. She cut down on her own food, especially on Friday, so as to be able to give something to those who knocked on the kitchen door. Discovering that the staff were used to discarding the abundant food left over from the Count's table, she also began to hand this out, too. Count Henry's mother was apparently unopposed to the charitable practice. But after the mother's death Henry's wife, Countess Ottilia, ordered that all leftovers be fed to the pigs. Dismayed, Notburga obeyed for a time, but then renewed her former policy. Unfortunately, the bossy Ottilia caught her red-handed one day and saw to it that she was fired. The young woman then found employment with a farmer at nearby Eben. Her new job involved fieldwork. A charming legend connecting her with harvesting has become a popular tale among the children of Tyrol. Notburga made a practice of going to church for Sunday's first vespers, and her employer had agreed not to interfere. One Saturday, however, when she was engaged in reaping, the vesper bell rang, indicating that Sunday had officially begun. The saint was getting ready to leave for church when the farmer ordered her to continue cutting the grain. She refused. With first vespers it was already Sunday, she said, and Christians do not work on Sunday. "But the weather might change and the crop be lost," he insisted. "All right," said the servant, "Let this sickle decide between us." Thereupon she threw the shiny crescent-shaped tool up into the air, and there it hung like a new moon! The farmer yielded, and she went off to church. Meanwhile, Count Henry was in a dejected state of mind. Bossy Ottilia had died and he had been suffering all sorts of misfortunes, which he was inclined to blame on his dismissal of Notburga. When he remarried, therefore, he asked her to return to his castle as housekeeper. She did so, and lived the rest of her life happily and holily in his employ. When Notburga was dying, it is said, she urged him to continue taking care of the poor. Furthermore, she instructed him to place her corpse on a wagon drawn by two oxen, and to bury her wherever the oxen might stop in their tracks. Henry complied. The oxen stopped right in front of the chapel of St. Rupert at Eben, so there she was laid to rest. Although long venerated in the western and Adriatic parts of the Austrian Empire, Notburga was never officially canonized. In March 1862, however, Pope Pius IX formally confirmed her ancient cult and her saintly title. 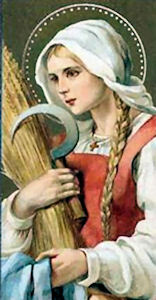 When St. Notburga is represented in paintings or sculptures, it is often with a sickle, either in her hand or hanging in the sky like a new moon. First known bishop of Cologne, in modern Germany. He was involved in the effort against the Donatist heretics and was asked by Emperor Constantine to hear charges against the Donatists in 313. In a legend defended by St. Peter Canisius, Maternus is labeled a disciple of St. Peter and the son of the widow of Naim, resurrected to serve the faith once more. Maternus died at Trier, Germany, where it is believed he also served as a bishop at one time. 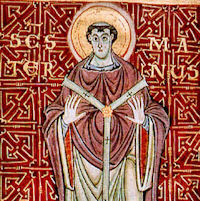 In art, Saint Maternus is a bishop holding a large key. 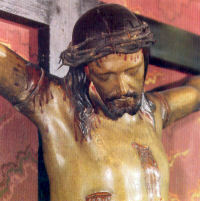 He may also be shown holding three churches combined as one or with a crozier and pilgrim's staff or hermit's crutch.